Arguments that abortion causes women emotional harm are used to regulate abortion, particularly later procedures, in the United States. However, existing research is inconclusive. 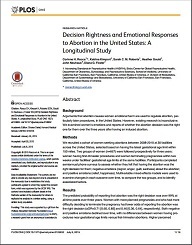 We examined women’s emotions and reports of whether the abortion decision was the right one for them over the three years after having an induced abortion. We recruited a cohort of women seeking abortions between 2008-2010 at 30 facilities across the United States, selected based on having the latest gestational age limit within 150 miles. Two groups of women (n=667) were followed prospectively for three years : women having first-trimester procedures and women terminating pregnancies within two weeks under facilities’ gestational age limits at the same facilities. Participants completed semiannual phone surveys to assess whether they felt that having the abortion was the right decision for them ; negative emotions (regret, anger, guilt, sadness) about the abortion ; and positive emotions (relief, happiness). Multivariable mixed-effects models were used to examine changes in each outcome over time, to compare the two groups, and to identify associated factors. The predicted probability of reporting that abortion was the right decision was over 99% at all time points over three years. Women with more planned pregnancies and who had more difficulty deciding to terminate the pregnancy had lower odds of reporting the abortion was the right decision (aOR=0.71 [0.60, 0.85] and 0.46 [0.36, 0.64], respectively). Both negative and positive emotions declined over time, with no differences between women having procedures near gestational age limits versus first-trimester abortions. Higher perceived community abortion stigma and lower social support were associated with more negative emotions (b=0.45 [0.31, 0.58] and b=-0.61 [-0.93, -0.29], respectively).